MORE than just printing. We are the starting point for all of your advertising, marketing, office equipment and consumer needs. We can find just about anything you may be looking for. We look forward to working with you from development to completion of any project that you may have. Business Cards, Letterhead, Envelopes, Flyers, Brochures, Forms, Rackcards, Invitations and more. We can create or redesign your corporate identity including logo, graphic and website design. We can create your website from scratch or spruce up your current site. Use our expertise to add videos or photogalleries to your existing site. We can host your website for as little as $15 per month, unlimited email addresses and more. We can setup and administer an Email and Internet Newsletter marketing campaigns. Utilize our Search Engine optimizatin resources to get your website ranked higher. 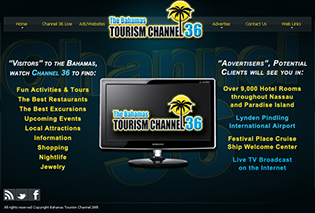 Our sister company, the Bahamas Tourism Channel is a full-fledged multi faceted video production company that produces Channel 36, shown in over 9,000 hotel rooms throughout Nassau including Atlantis. Also shown on Big Screen Plasmas at the Lynden Pindling Intl. Airport and the Festival Place Cruise Ship Welcome Center. Banners, Tradeshow Displays, Signs, Magnets, Posters, Bumper Stickers, Labels and more. Shirts, Apparel, Caps, Mugs, Logoed Golfballs, Pennants, Keychains and more. Fathead Sports and Custom Wall and Car Decals. Turn your photos into canvas paintings. USA Mailing Address and Phone Number, USA Mail and Package Forwarding Service. Office Furniture, Computer and Electronics Shopping. PC Repair and Optimization, Software Installations, Virus and Spyware Removal.